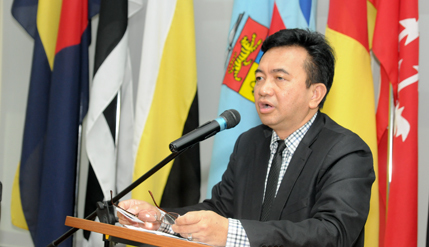 BANGI, 5 June 2014 – Researchers and academics from seven countries have agreed that the role of higher education in innovation, policymaking and development is critical in adapting to the complex problems brought about by climate change. Universities should thus send a strong message to governments on threat brought about by climate change. They were speaking at a one-day 8th United Nations conference on Climate and Ecosystems Change Adaptation Research (UN-CECAR) here last Friday. It was jointly organised by The National University of Malaysia (UKM) and the United NationsUniversity’s Institute for the Advanced Study of Sustainability (UMU-IAS). Among those who spoke was UKM Deputy Vice-Chancellor (Research and Innovation) Professor Dato’ Dr Mazlin Mokhtar, who said UKM had always advocated universities take the leading role in helping governments to deal with global warming and how to mitigate its effects. Prof Mazlin said his research at UKM and UN-CECAR had come up with several modules on sustainability and leadership solutions. He is an international fellow at UN-CECAR and the United Nations for Training and Research Centre at Switzerland. Another presenter Dr Janette Lindesay from The Australian National University (ANU) revealed that the world will be seeing more devastating typhoons because of climate change with the air and seas are getting warmer. More than 80% of excess warming is not in the atmosphere, but in the oceans, she said. Dr Linesay said most nations which emit fossil fuel wastes have missed the targets for reduction in air pollution, including China, The United States and the European Union. Since 2010 emissions from fossil fuel burnings have increased by 5.9% annually. She said excess heat and water means that the atmosphere contains more energy which will translate into more tropical storms. There is a 95% probability that that global warming is mainly due to human activity or anthopogenic. A sound understanding of climate variability is essential to an understanding of climate change. Thus both long-term average climate characteristics and climate variability are included, with an emphasis on the processes and phenomena that influence inter-annual and longer timescale fluctuations in climate (including the El Nino, Southern Oscillation and Pacific Decadal Oscillation). Prof Dato’ Dr Sharifah Mastura Syed Abdullah, director of Institute of Climate (IKP-UKM) spoke about loss of land in Selangor due to development. Selangor had experienced a loss of up to 10% of its forests in the 22 years between 1990 and 2012 continues to face forest degradation. She said deforestation was due to economic and development factors including increased farming and urbanisation arising from a growing population. The continued degradation of the remaining forests is a major concern to her. Knowledge on deforestation and its driving forces in Selangor is very important as it provides the basis for the calculation of the total amount of carbon stock remaining above ground, Prof Sharifah Mastura said. Some 15 academics and researchers presented their research papers at the conference . Established in 2009, UN-CECAR is a network of universities and research institutes in Asia-Pacific and Africa which are actively engaged in advanced research and education in climate change, ecosystem change and adaptation.